Stellar service is the standard at The Wilshire Grand Hotel. The manager hosts a wine, beer, and hors d’oeuvres reception in the lobby weeknights, the business center and fitness room are open 24 hours, the shuttle to nearby offices and restaurants is free, and there’s always a plate of homemade cookies in the lobby. All rooms have small pleasures like Wolfgang Puck gourmet coffee and the Wall Street Journal online, and many have Jacuzzi tubs. There’s a 24-hour Sweet Shoppe in the lobby for an ice-cream or a salty snack, and a complimentary juice and coffee station. The lobby is roomy and has areas to lounge and to work, and wireless internet access throughout the hotel is free. Take one of the hotel’s beach cruiser bicycles and explore the lakes and trails of nearby Verona Park. For downtime closer to home, the hotel patio has a putting green, and a grill for a late-afternoon barbecue. The Zagat-rated Primavera Restaurant offers a full menu of Italian fine-dining. The mozzarella is homemade, and the Rock Shrimp in White Wine with Lemon and Garlic is a house specialty. A full breakfast buffet is served in the hotel every day, free of charge. 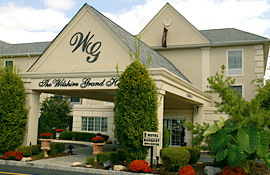 The Wilshire Grand Hotel is 30 minutes from New York City and 20 minutes from Newark Liberty International Airport. Corporate offices and the New Jersey Institute of Technology are nearby. For weekend Stays: 72 hours prior to date of arrival, or penalty of one nights room and tax. Weekday stays: 4 p.m. cancellation for same day (non group only) or penalty of one nights room and tax.